NEW! Bahco P74 Grass Lawn Shears - Long Handled - 1100mm Length. Bahco grass lawn shears - ideal for those spots that lawn mowers miss. Suitable for cutting in and around shrubs, borders and trees. 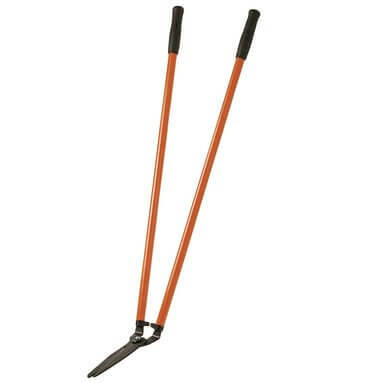 90cm long handles shears provide easier to those hard to reach areas in the garden. Stamped hardened steel double bevelled blade with straight cutting edge. Stamped hardened steel, flat-edged counter blade. Xylan® coated blades to prevent premature rusting. Plastic buffer to reduce jarring.